Those of us who have been quilling for a while are quite familiar with the fact that different paper companies produce vastly different products. Some quilling paper is thicker than others. Sometimes a color can vary greatly from brand to brand. But one type of paper requires another set of quilling tricks all together, and that is metallic paper. 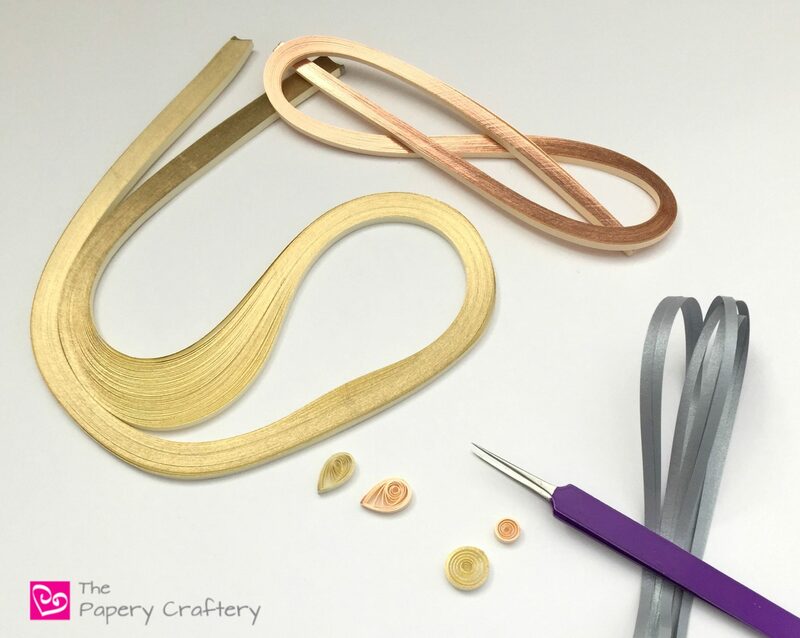 This week, I’m sharing a few tips for using metallic quilling paper for your crafts. The first step of working with metallic quilling paper is to choose the right paper for your project. 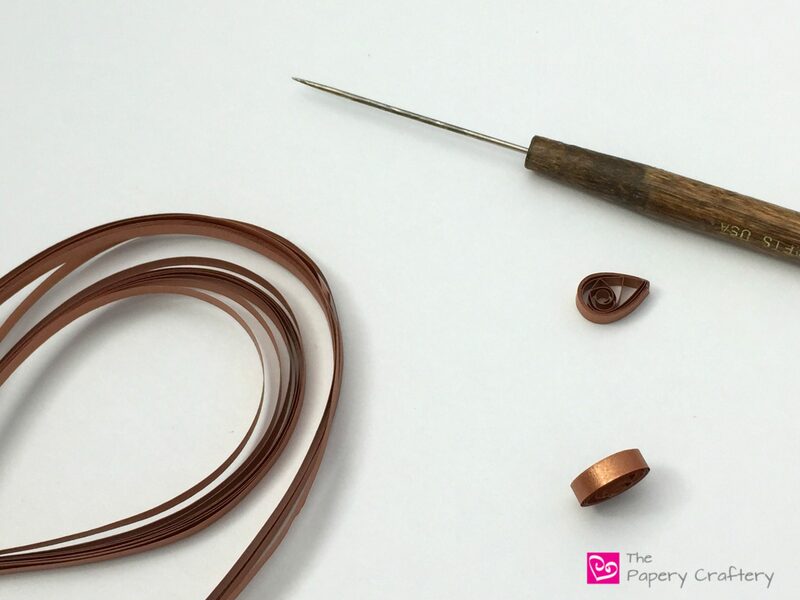 There are two types of metallic quilling strips: pearlized paper and true metallic paper. Pearlized quilling paper has a shiny, iridescent finish all over the width of each strip. They tend to have a thicker weight than other quilling strips and a glossy surface. These characteristics make the pearlized paper a little tricky to roll and shape. Because it’s a little heavier than most paper, it takes longer for the glue to hold. To help this along, I like to carefully pinch shapes with a tweezer after gluing. This gives my glue an extra bit of oomph. And, a reminder that is especially helpful with thicker paper, avoid cutting pearlized paper. Tearing or ripping your strips really gives the glue a ragged edge to hold on to and allows for smoother coils and shapes. Because pearlized paper’s sheen is on the wide side of the strips, it is useful for projects that need a subtle shine, like my quilled horseshoes. I also like it for 3-dimensional quilling. 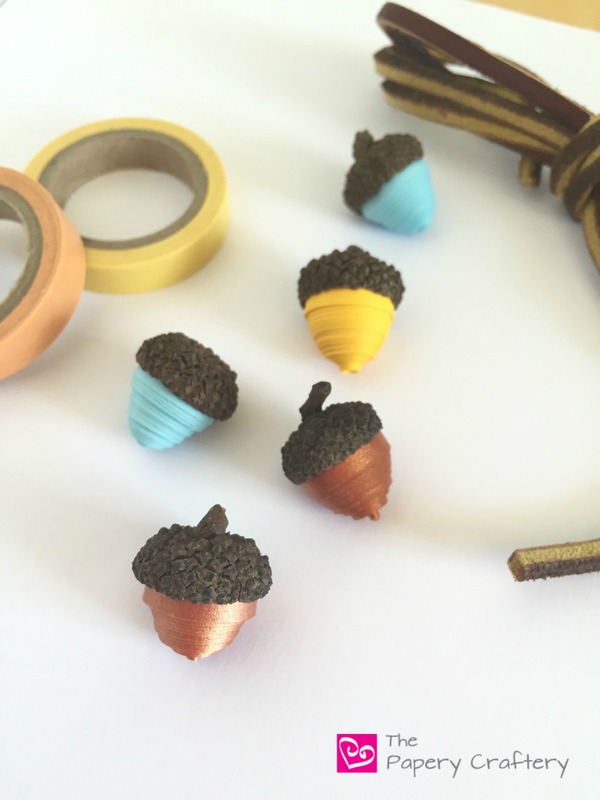 One of my all-time favorite projects, these quilling paper acorns, uses the shimmer of pearlized copper paper to pop against the rustic acorn tops. True metallic paper is traditional weight quilling strips with an extremely bright and shiny edge. This type of paper is great for quilling paper jewelry, like the examples Ann Martin teaches in her book, The Art of Quilling Paper Jewelry. If you haven’t picked up a copy of her book yet, read my review here. It’s so inspiring! Because the majority of the makeup of this type of strip is lighter weight paper, no real extra technique involved in making coils and shapes. Your usual glue will work just fine. I wouldn’t use metallic-edged paper for your 3-D creations often, though. You won’t get the proper effect of this special paper. Both types of metallic papers come in loads of color choices. I’m a big fan of the silver, brass, and copper from Paplin. I’m not usually a gold fan, but this gold and ivory paper from Lake City Craft really speaks to me. I’ve also picked up a package of this rose gold paper from JJ Quilling Design. It’s really on trend this year. Don’t forget about the rest of the rainbow! Check out this jewel-toned pearlized paper! With these tips for using metallic quilling paper, you’ll see these special papers aren’t anything to shy away from. They can be a little bit pricier than other strips, but they really do pack a wow! Have you played with metallic quilling paper? What types of crafts have you used it for? I know I’ve got some ideas for holiday creations, but I’d love some new ideas. Leave a comment on this post and share some inspiration! Love your work! I do some quilling but my passion is pergamano (parchment paper) cards. Thanks Linda! I don’t know anything about pergamano. I’m going to look into that! Ich bin froh, dass ich dir neue Ideen geben konnte. Ich hoffe, es ist hilfreich für deine Quilling!